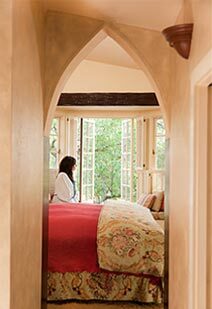 The Old Monterey Inn is truly a spot steeped in history! On this site, much of Monterey’s history came to pass. For the Old Monterey Inn was built by Carmel Martin Sr. who was instrumental in the creation of the city and preserving many of the historical sites open to the public today. It was here, in this house, Mr. Martin planned for and dreamed of his beloved Monterey. The story begins when the Scottish-born Martin family arrived in the Monterey Bay, en route to San Francisco and the California Gold Rush, in March of 1865. Their schooner stopped in Monterey for a half day to unload some cargo. The Martins went ashore, past the adobe buildings that comprised the village of Monterey, up the hill, and spread a picnic lunch under the oaks and pines. They fell in love with the land and stayed. The Martin Family purchased land throughout the county, including the spot that had enchanted them upon arrival: the site where the Old Monterey Inn stands today. Through farming, the Martins prospered and multiplied. Over the years, the family was to play an important role in the history of the Monterey Peninsula. Carmel Martin Sr., the grandson of these early pioneers, would eventually settle on the hill above the village. Here, he and his new bride, Lydia, would build their dream home to reflect Mrs. Martin’s taste in English Tudor. The grand 3-story manor was completed in 1929 with the help of the area’s finest artisans, featuring hand carved newel posts, window frames and balustrades, hand plastered Gothic archways and bull nose corners, and hand painted ceiling panels in two designs. 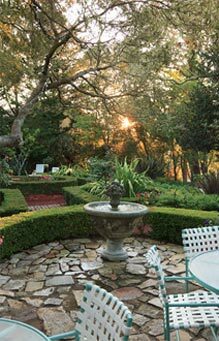 The home sits in the middle of over an acre of beautifully landscaped gardens boasting some 100 trees, which includes Monterey Pines, California Oaks and tall Redwoods. Much of the original stonework still remains. Due to his efforts, you can tour such local historical sites as California’s First Theater, the Custom House, the Brown-Underwood Adobe, House of the Four Winds and Gutierrez Adobe, during your stay here in the Martin’s family home. The Old Monterey Inn is located on Martin Street, which was named in honor of the man who helped to make the city what it is today. After Mr. Martin’s passing in 1965, the home was occupied by the Swett family and their six children. It was thoughtfully restored in every detail, including the Martin’s prized gardens and opened as a bed and breakfast inn in 1978. After owning bed and breakfasts in Mendocino and Napa Valley, Patricia Valletta purchased the inn in 2004 only to elope with her high school sweetheart in 2010. 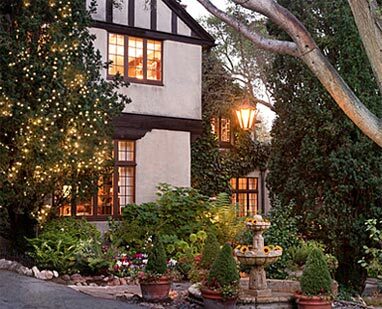 They sold The Old Monterey Inn to Lawrence Havlick after his fairy tale wedding in our traditional English garden. In 2016 Ying Sun’s family purchased the beautiful bed and breakfast with heavenly-like garden. Sun’s family welcome you to this historic site and hopes you enjoy exploring this Monterey bed & breakfast.